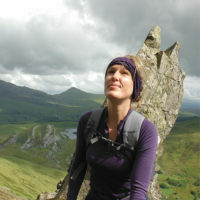 Carl McKeating and Rachel Crolla updated Steve Ashton’s classic guide book Scrambles in Snowdonia. They reflect on the experience and responsibility of handling one of the classic texts in outdoor pursuits. The idea of hiking up all the 3000ft mountains in Wales appealed immediately. Dave ventured off to his bookshelf and returned with two Steve Ashton books: Scrambles in Snowdonia and The Ridges of Snowdonia. ‘These will come in useful, they’re both absolute classics,’ he said. 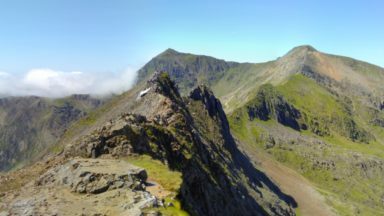 A couple of days later we found ourselves – led by Steve’s descriptions – scrambling on the North Ridge of Tryfan, Bristly Ridge and the following day on the Snowdon Horseshoe. On agreeing to undertake the mammoth task of updating Steve’s inspirational and much-loved Scrambles in Snowdonia, we immediately felt a great responsibility, as well as a great sense of privilege. Here was a guide that had not only introduced a new and now standard scrambling grading system to British climbing, but had helped to re-establish and even define an ancient facet of mountaineering that bridged the gap between adventurous hill-walking and easy grade rock climbing. Yet this was not just a guidebook, but a work of great outdoor literature: few can have read Steve’s description of Yr Esgair, for example, and have been left in any doubt that he is writer a cut above the rest. Rachel: Despite our huge affection and respect for Steve’s original work, there was no doubt that an update was long overdue. 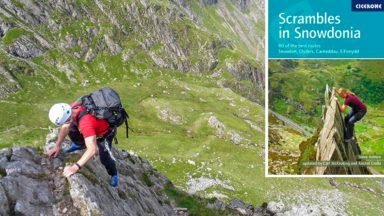 Scrambles in Snowdonia was originally published in 1980, and was most recently revised for the second edition in 1992. In the intervening quarter of a century things had understandably changed, both on the ground and in the expectations of the readership. Other things had changed too: Steve had now retired from climbing and guidebook writing. It was a heavy mantle to pass onto our shoulders. As new parents once again, we were re-examining how we spent our time and also re-examining what we felt comfortable with in terms of climbing. The project would entail a colossal amount of work: could we logistically do it? There was also the question of risk: did I personally still have the head for heights? 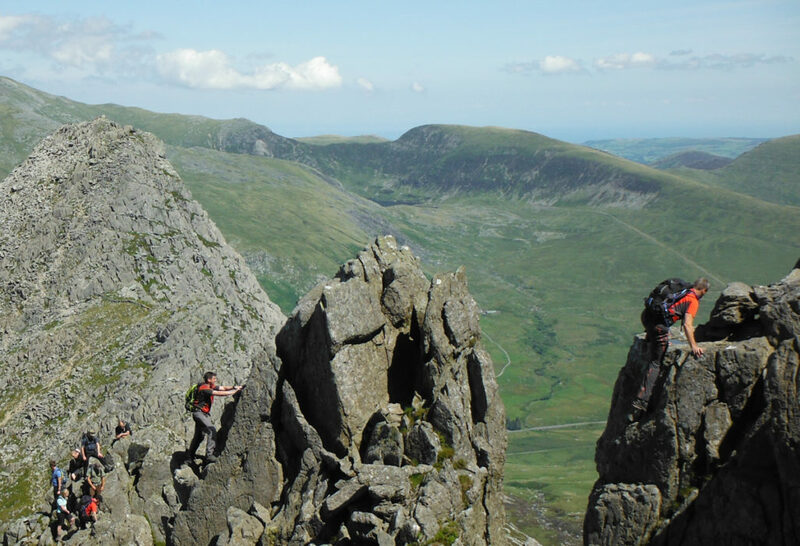 Nevertheless, Scrambles in Snowdonia was a project we could not turn down. We set about doing the nuts and bolts work: meticulously checking every detail, every move, approach and descent. The job needed to be done properly. We felt it was beneficial to have two fresh pairs of eyes reappraising the original work. There was also a need to make the book appeal to a new generation of 21st century scramblers. 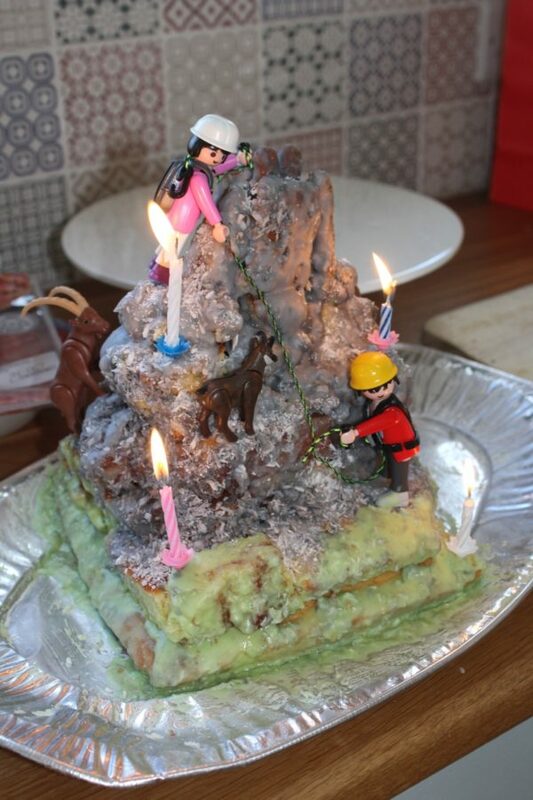 The presentation of British climbing guides had moved on since 1992. Books had become increasingly visual, with a higher photographic content, and we decided to include an inspirational picture of a scrambler, usually at a key point, on every route in the new edition. For the original guide Steve was ahead of the curve, including a few black-and-white photo topos when hand-drawn crag shots were the norm. Now we would provide clear colour photo topos for each crag with carefully plotted route lines marked on by hand. Mapping expectations had likewise evolved, and high quality OS maps would be included in the new book. So here was an opportunity for us to preserve Steve’s classic work but simultaneously take a book we loved and move it forwards into a more visual age. Our aim was to make the new edition stylish but useable, with extra content but still at a relatively small size so as to perfectly balance style and content. Carl: Grades are always the most hotly debated and contentious aspect of climbing guidebooks. While consensus can be reached, there will always be an element of debate and disagreement. This is healthy: indeed, grade debates are one of the great armchair climbing pastimes! Rachel and I are proficient intermediate grade rock climbers who come from a hiking and mountaineering background. I am happy to solo grade 3 scrambles – but Rachel, especially since having children, often prefers a rope on grade 3s. Neither of us are extreme rock athletes. To an extent this helps us have a subtle appreciation of the marginal differences between the grades of scrambles and easy grade rock climbs: it also allows a degree of affinity with the majority of scramblers. Listening carefully to users of the original guide and taking on board feedback about grades and difficulties encountered was important – while simultaneously being conscious of avoiding grade creep. We decided it would be helpful to subdivide the grades using a + or – symbol and bring in the grade 3S, which Steve had considered for the original guide. 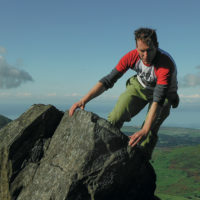 The 3S grade will be familiar to users of pre-millennium editions of Brian Evans’s Scrambles in the Lake District guide books published by Cicerone. 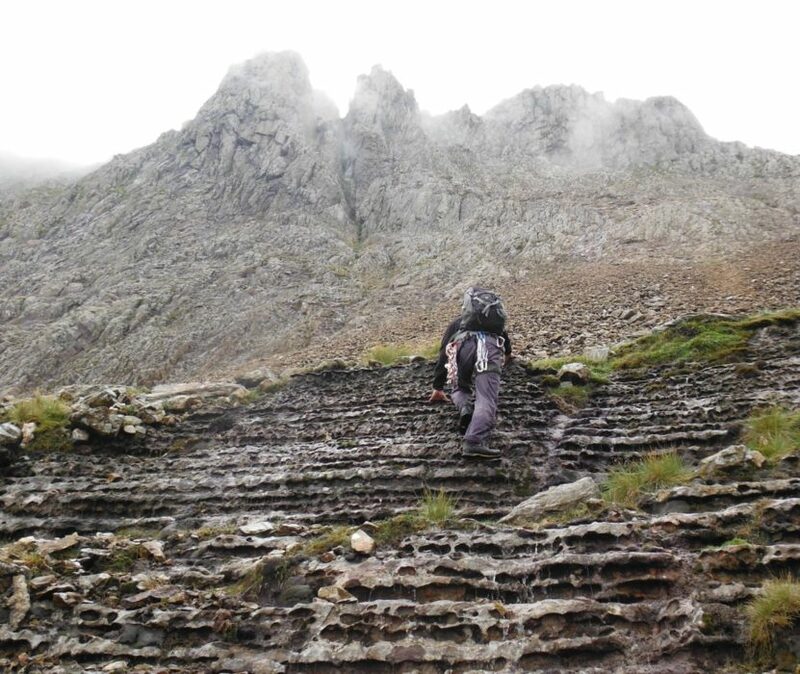 The subdivisions are perhaps most useful at grade 1, where novice scramblers will appreciate prior knowledge of the difference in commitment and exposure between a route such as the Southern Ridge Circuit and the Snowdon Horseshoe. On the whole we found Steve’s original grades and descriptions to be astoundingly reliable – especially given the fact that Steve had been solely responsible for them. Climbing guide books tend to evolve over generations, with each new edition worked on by a new team of writers who build on the work of the previous generation. For Steve to have been so accurate as a sole author is testament to his skill. When checking the routes for the update I lost count of the amount of times I would reach a point and think ‘this is never going to be X or Y grade’ only to reach up and find the holds exactly where they should be. Carl: When compiling the new guide our greatest consideration was selecting the routes to be included. Steve devised many of the routes from scratch, and unearthed many others from the dark obscurity of ancient climbing guides and journals. As a result of his book, many of these routes had become well-travelled, but others never really caught on and had, in a couple of cases, succumbed to nature. Over the intervening 37 years, there had been a gradual increase in scrambling in the area, largely as a result of Steve’s key text. 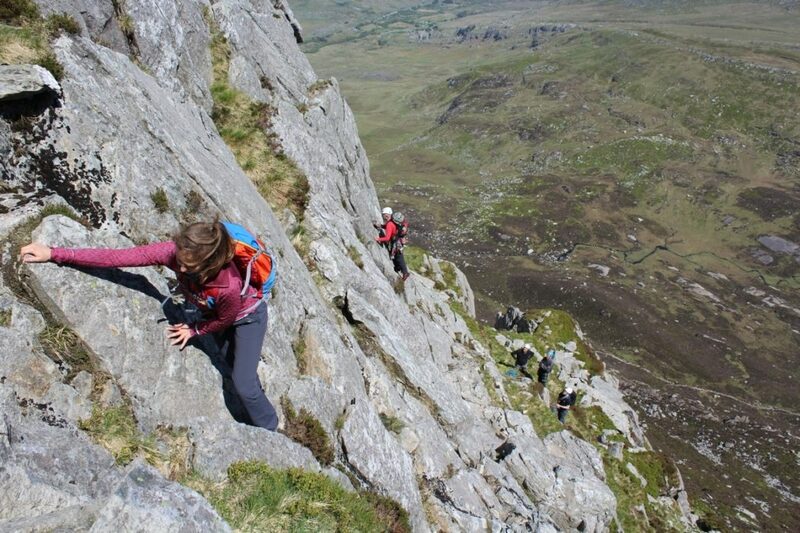 Extra routes – especially those on the West Face of Tryfan – now begged for inclusion. Which to add and which to remove gave us both much pause for thought. Working on the premise that if a route did not warrant a star it should not be included, we actually only needed to dispense with just five routes from the last edition of the guide. On the other hand, we added sixteen new routes across a wider reach of the National Park. 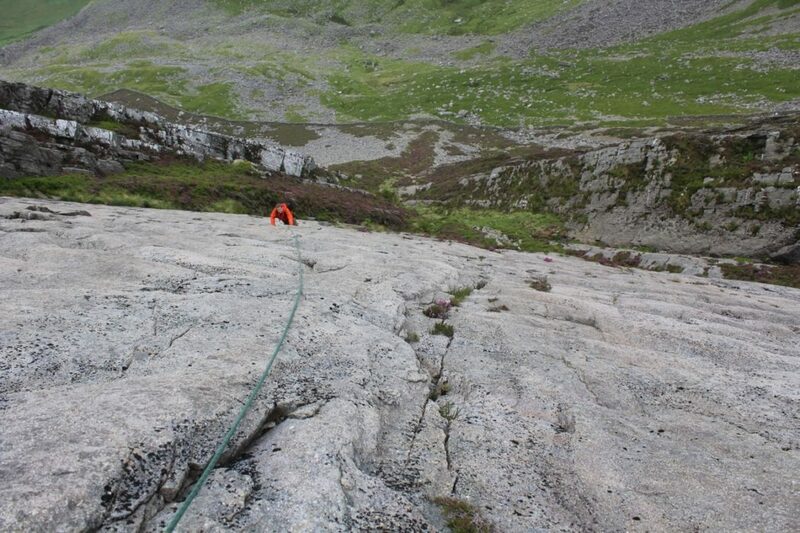 The newly added routes cover the full spectrum of the scrambling grades. 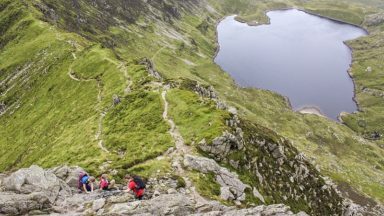 They include a number of classic three-star lines, from the grade 1- of the Moel Siabod Ridge Circuit (a fantastic beginner’s scramble), through Notch Arête (a grade 2 route on the West Face of Tryfan), to the famous Cyfrwy Arête on Cadair Idris (a 3 or 3S depending on the line opted for). Two routes I was particularly pleased to bring into the guide were Esgair Felen Direct and the South Ridge Variant, Rhinog Fach (which had once been known as the Hywel Ridge). 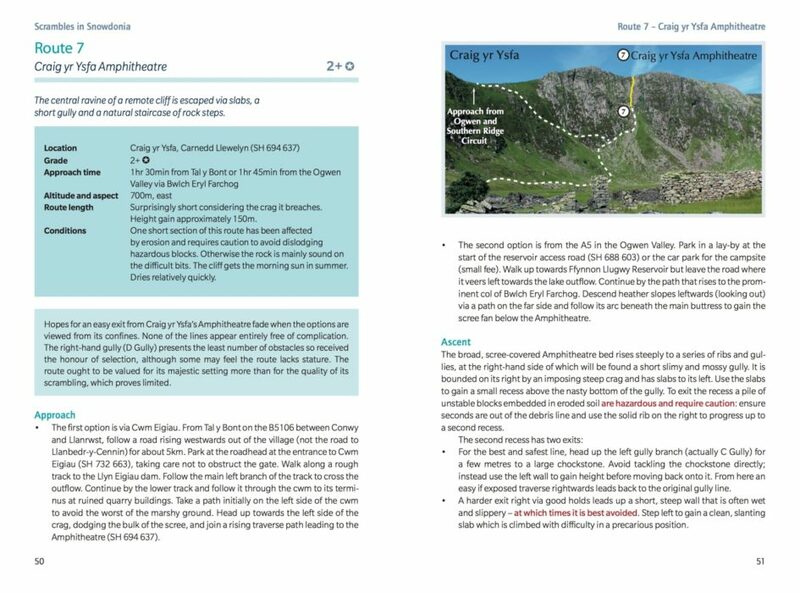 Esgair Felen Direct was a route I designed in response to the fact that the only scramble that connected the Pass of Llanberis with the Ogwen Valley was Bryant’s Gully. Although Bryant’s is a sensational three-star route, because it follows a watercourse it can be a very wet outing. 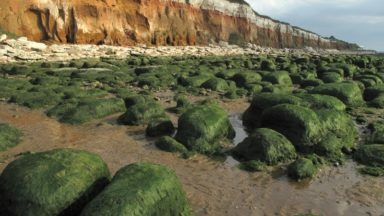 Although Esgair Felen Direct is not a wholly consistent or sustained scramble and only merits a single star, it is however a very long – not to mention dry – route that involves considerable amounts of scrambling in a fantastic and rarely visited setting. The South Ridge Variant really mirrored Steve’s original approach to choosing scrambles for the guide: it brings a long forgotten route – the Hywel Ridge – out from the shadow cast by a Severe grade rock climb and gives the scrambler a superb option in an incredibly picturesque and less-frequented area of the National Park. 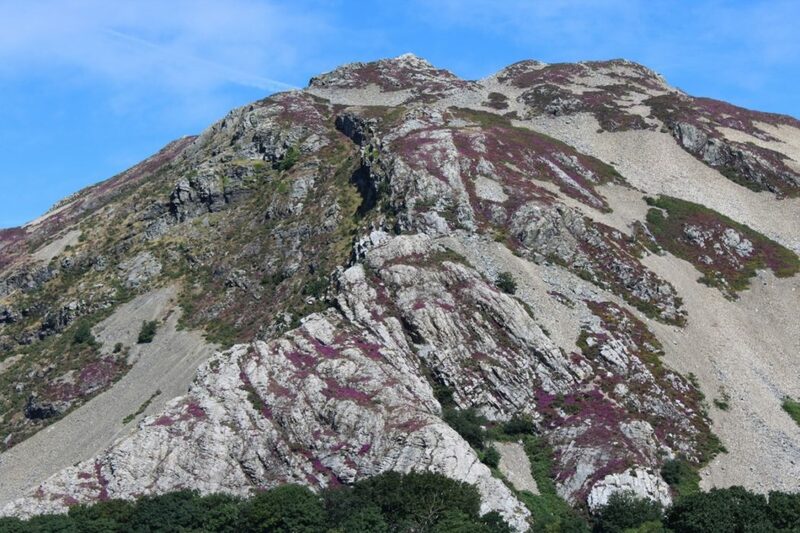 Rachel: A route that I was keen to bring into the new edition was the hugely enjoyable easy scramble up Penmaenbach Arête. Although I imagine that the route may have its detractors, due to its proximity to the A55 in the very north of the National Park near Conwy, I felt that it is a great line and adds extra breadth to the book. Carl: Never underestimate how much fieldwork alone goes into producing a guide book. For instance, when it came to checking potential routes there were a fair few false leads, just as there had been for Steve when he worked on the first and second editions of the original guide. Entire days were spent on scrambles that looked, either on paper or in passing, worthy of consideration. 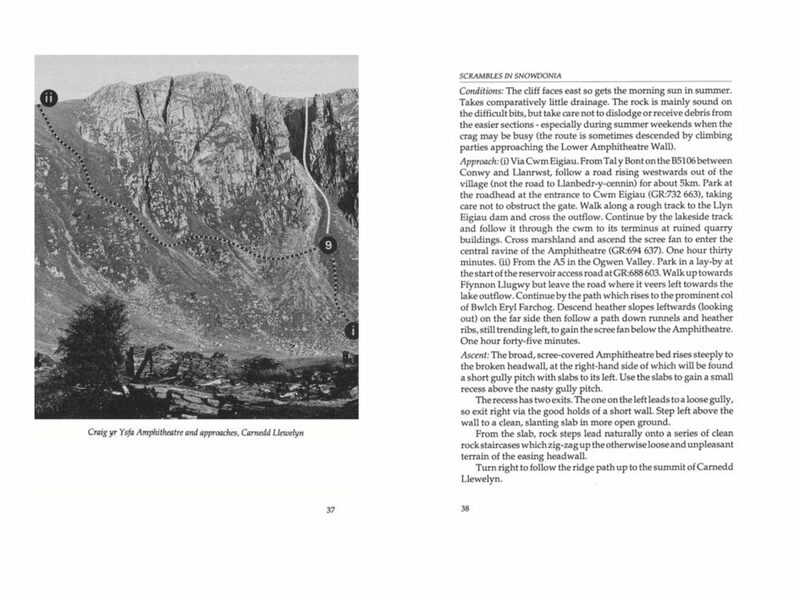 In addition to the numerous exploratory scrambles that did not end up in the book, I remember taking volunteers out on three routes – Waved Slab on Carnedd y Filiast, East Arête at Idwal and Crazy Pinnacle Gully on Crib Goch – only to conclude they were too hard for inclusion (the first two routes are worth seeking out as lower grade rock climbs: as for Crazy Pinnacle Gully – forget it!). Occasionally changes in the terrain ended up working in favour of old routes. For example, the entry steps on Broad Gully Ridge had become hopelessly greasy, while some piled blocks on its middle section had changed, so an adjustment to the route was necessary. In resolving these issues the route is now much longer and better than it once was. Some of the decisions to move routes out were easy to make. 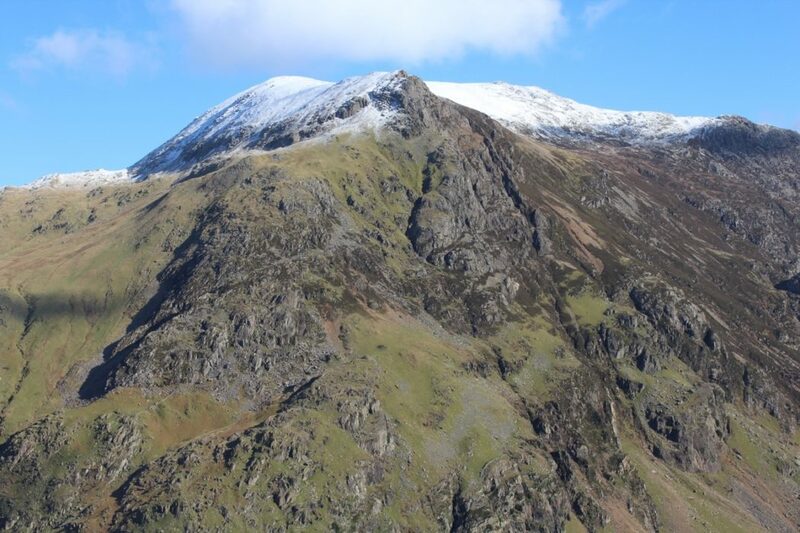 The Western Arête of Y Garn, Pennants Rib and Right-Hand Pennants Rib, three routes that functioned as Nantlle Ridge variations, involved unstable rock. Although that was not a reason in itself to remove a route – after all, the classic and very popular Sentries’ Ridge is quite a rickety route – these just involved a greater risk factor that was not offset by other benefits. A route in Ogwen on Pen Y Ole Wen – the Braich Ty Du Face Right-hand Start – was overrun by gorse. This was a shame: the route had good potential. I climbed it three times, shredding my legs on the gorse on each occasion, before being satisfied it was best taken out. Rachel on the other hand was less equivocal: after one ascent she simply said, ‘The gorse makes what’s already a hard route hazardous and hideously unpleasant – it’s got to go.’ We knew we could still update the removed routes and find a place for them on the book’s supporting webpage for any scramblers keen on esoteric scrambles certainly made decisions easier. 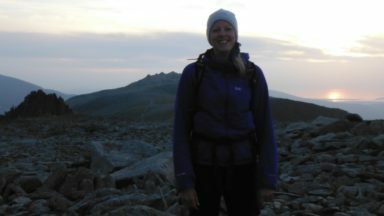 Rachel: One of the fantastic characteristics of scrambling is the freedom of weaving an amenable way up a steep crag or mountain. The routes are often much longer than traditional rock climbs: it is impossible to describe every move, crack, block or chimney that has to be overcome. In fact, doing so would detract from the enjoyment scramblers derive from finding their own lines. Steve’s text is quite succinct, and one of the challenges for both of us was to avoid being too prescriptive and succumb to overwriting. 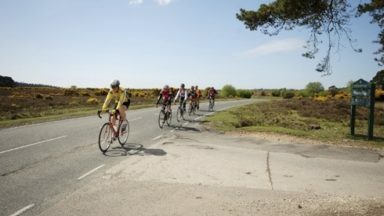 On the other hand, we were both very aware of the need for extra detail in places where people had gone wrong in the past or where there were increased consequences of straying from the route line. The crucial aim of the writing remained unchanged: that scramblers should find their way over the best rock safely and enjoyably to the top of the routes. Marrying our writing tone with that of Steve’s was something we really wanted to get right. As custodians of such a classic book we were very protective over the original text in a way we would not have been had it been our own work. To a certain extent, when it came to scrambling, Steve’s ethos and writing style was similar to our own, so there was a natural fit. Nonetheless, we were fussy (some might say pedantic) about getting the tone spot on. Both of us would agonise over word selection to a point that many, ourselves included, would find tedious: ‘I don’t think Steve would use that word’ was a typical challenge we gave each other. Or we might ask, ‘is this Steve-ish enough, do you think?’ Steve’s writing itself would tend to settle things. 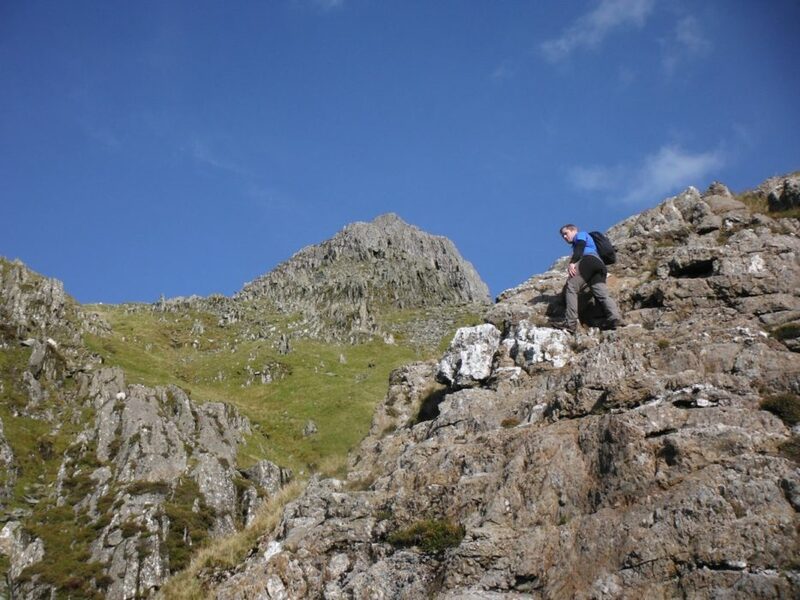 A debate over whether to use ‘fairytale’ as an adjective to describe a peak or a route, for example, was resolved by looking at his writing and finding that the word appeared elsewhere. 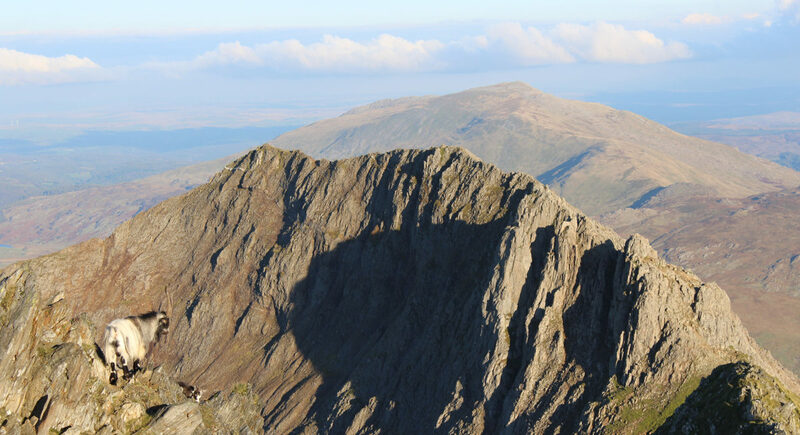 When adding routes in different areas, such as Cadair Idris and the Rhinogs, we even looked at Steve’s other work on the Welsh mountains to help us see them from his perspective as well as our own. Despite our keenness to preserve the original tone, starting out on the project it really helped that Steve was able to hand the guide over without pre-conditions. Likewise, knowing Steve was approachable and able to give support if we needed it was a great reassurance. From the outset, however, we also realised the importance for us to retain a distance and be able to approach the book with fresh eyes. 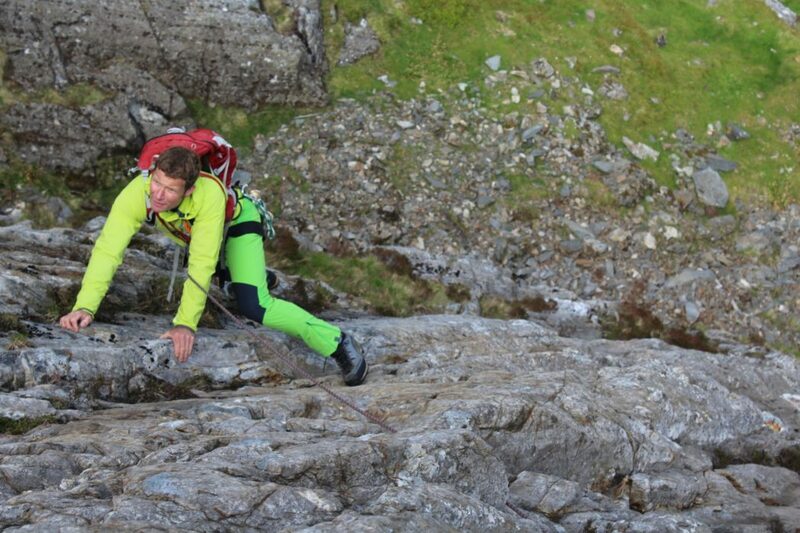 Although challenging, producing the new Scrambles in Snowdonia has been an awesome experience. The Cicerone production team were able to design it exactly as we envisaged. Now a new generation of readers will be able to use this classic text. Steve’s writing and his brilliant contribution to British outdoor pursuits, for which we should all be thankful, lives on.